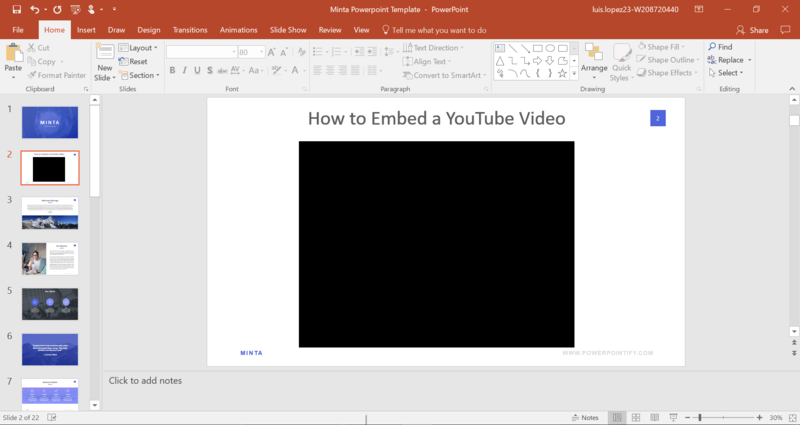 Are you looking for how to add a Youtube video to Powerpoint? 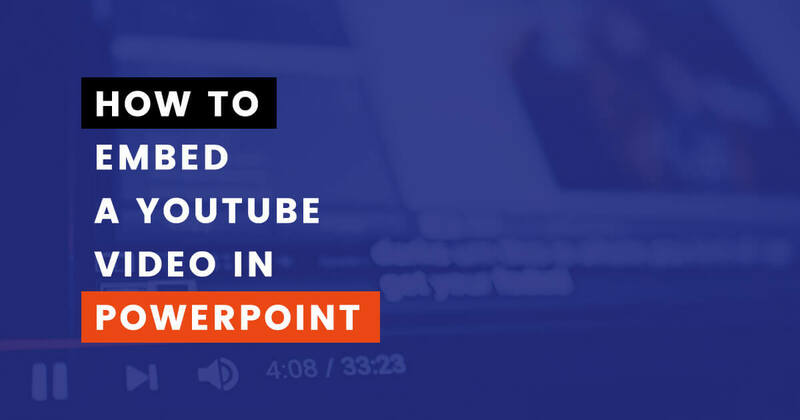 In this article, I’m going to explain step by step how you can embed any YouTube video into your Powerpoint presentation. If a picture is worth a thousand words, then how much is a video worth? Videos are great visuals to enhance the audience’s attention. If that is not convincing enough, then three good reasons to add videos are: they provide compelling content, stops monotony and helps the audience relate to the topic presented. Not only will you be able to give your audience a clear message, but you will also entertain them, making the presentation more enjoyable. The number one place people go to look for videos is YouTube. YouTube has all kinds of videos, whether you are looking for inspirational videos, educational, or videos just for entertainment, you can find them all on one website. 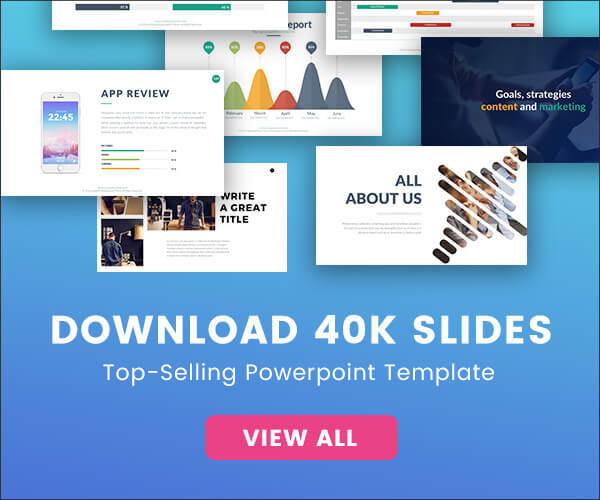 For this reason, we want to help you make a creative Powerpoint, that uses video to visually capture your audience’s attention. 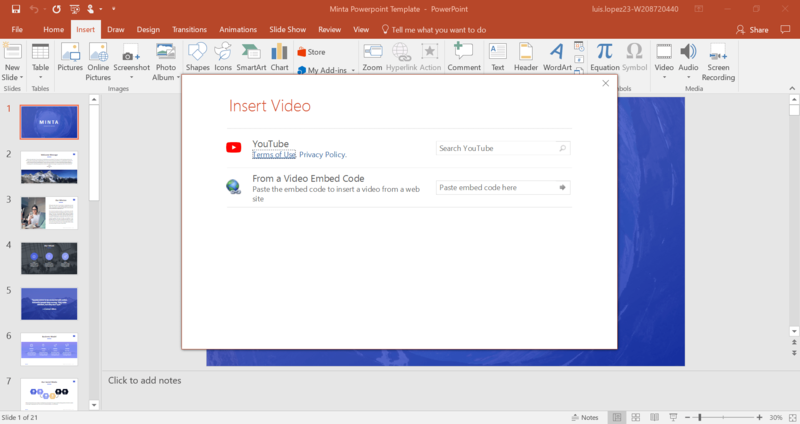 The Embed Code technique is one of the most advanced ways to add a YouTube video to your Powerpoint presentations. Since it is a more advanced, this technique may be a little more challenging to use but rewarding if you do it right. 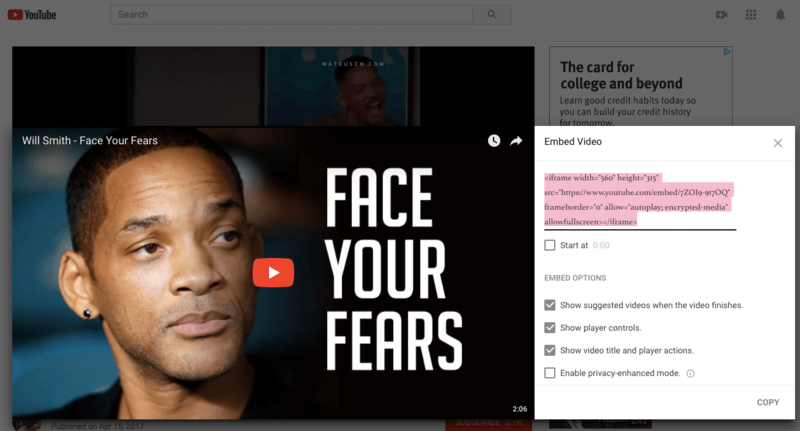 With this technique, you will be able to customize the video by using the YouTube API parameters. What does that mean? Well, in a lot of cases when giving a presentation you are given a time limit. If your presentation has a time limit, you do not want to have to deal with the commercial at the beginning and have to skip the long introduction that is irrelevant, that could just make you waste time. Or sometimes, you just need to show different parts of the video, and you don’t want to be skipping around in front of the audience that just looks disorganized and unprofessional. 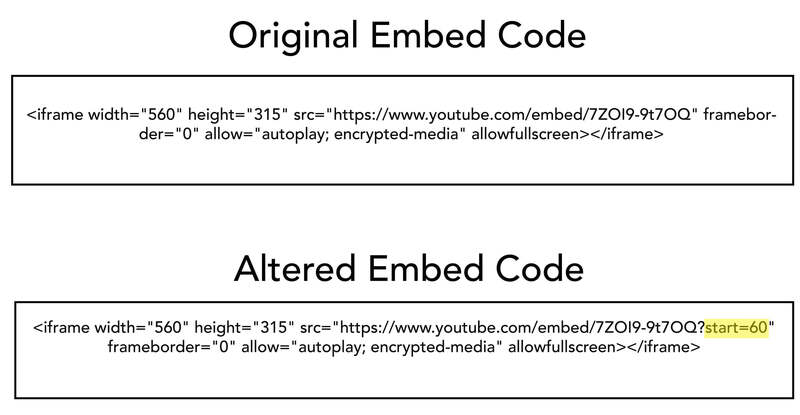 Instead, when you use the Embed Code technique, you can alter the code to show just what you want your audience to see, without having to do it at during the presentation. Doing that can make your presentation look unprofessional, as a result, you will lose your audience’s focus and interest to your presentation. First, you have to go to YouTube and find the video you would like to use for your presentation. 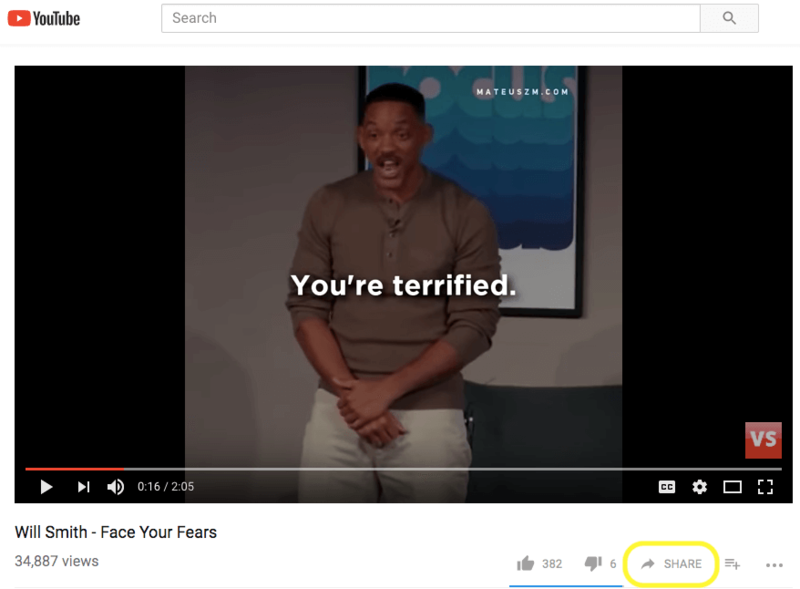 When you have found your video, below the video you will find a Share tab. When you click on the Share tab, you will get the following options. The Share Tab may look something like the image below. There you will find the Embed tab, which you will need to click on. When you click on the Embed Tab, you will find a long strand of letters and numbers. This long strand is the code that you want to add the video to your presentation. So, what you want to do is highlight the whole strand and copy it. When you have found the video you are going to use and copied the embedded code strand, then you want to open your presentation and select the Insert tab. In the Insert tab, you want to look for the video icon to click on. When you have found Video, you are going to click on it and that will provide a drop box with two options. Since your video is from YouTube, you will click on Online Video. When you click on Online Video, another box is going to pop up. Since you are going to Embed Code, you will choose the second option, and paste the embed code strand in the text box provided. 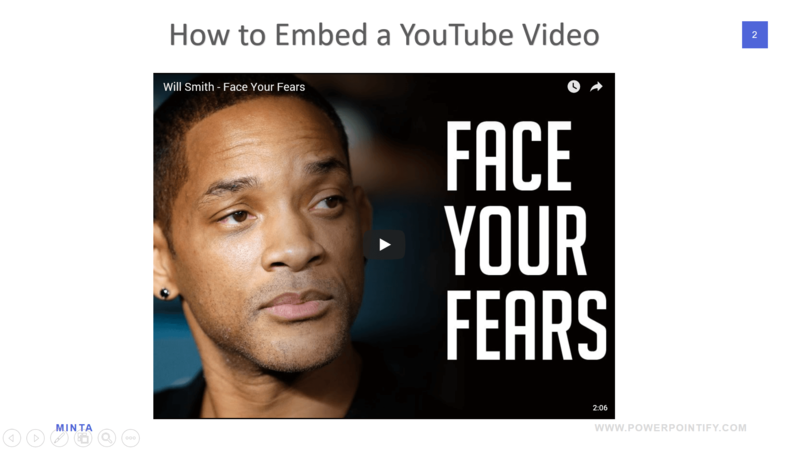 Like mentioned before, embed code allows you to customize the video before adding it to your presentation. For example, the video used as a demonstration is not that long, but let say instead of the two minutes it lasts, I would like to shorten it and start it a minute later, this technique makes that possible. For me to start my video a minute later, at the end of the link you would add a”?” followed by the code. So, for this example, I would need to add “?start=60” after the link to start my video automatically a minute later, rather than having my audience watch me forward or skip the beginning. In the image above, you can see where that code to start the video a minute later was altered. The highlighted part is the code added to make the video start a minute or 60 seconds after the starting point. At the end of the link you would add a “?” to show the first parameter, then the”&” is to show every different parameter used.For example, if you do not want any related videos to pop up when the presentation is done, then your code would look like the image shown above. So for this example, the code added would be: “?start=60&rel=0”. When you have added your embed code strand to the text box, press enter, and your video will appear on the slide. Here is the video, even though it looks like just a black-square-box. Don’t worry your video is there! You can move and resize the video within the slide to present it how you want. This would be your final result of how your slide would look when presenting. Your video may start automatically as soon as you get to the slide if you add the code, or you can manually start it giving it an introduction before you show it. 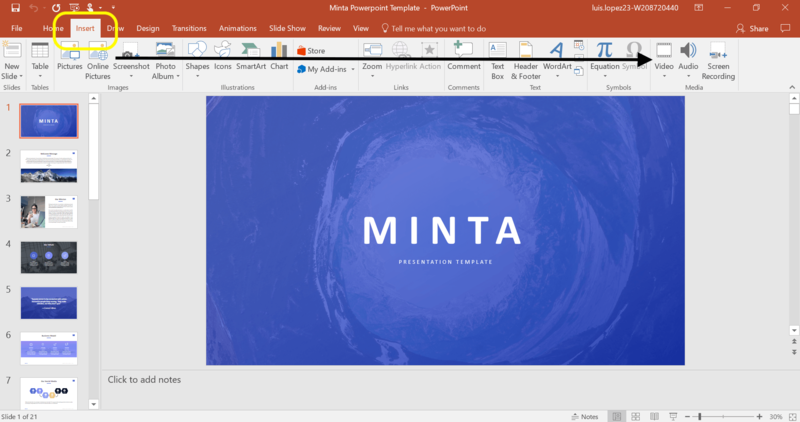 In conclusion, using the Embed Code technique can make your presentation run more smoothly. Unlike just adding and pasting the link, you have more control over what you are showing to your audience. It may take a little longer to add in the video, but the end results will be great. So, impress your audience with a video that is appealing and relevant to your topic. Don’t just present, but stand out from the rest.